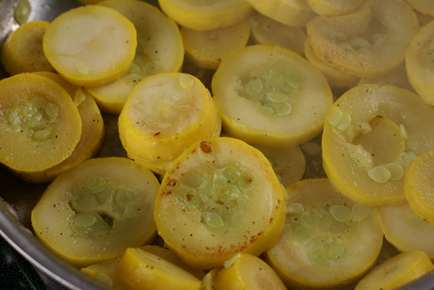 Sauteing summer squash…it has never worked well for me. I mean, it works…but not perfectly. I recently figured out that if I partially steam it before sauteing it…the results are quite tasty! 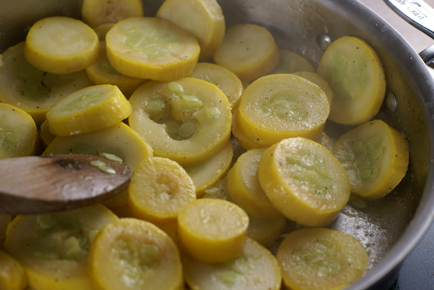 Place the sliced squash into a skillet with the water, sugar and olive oil. Season with salt and pepper to taste. 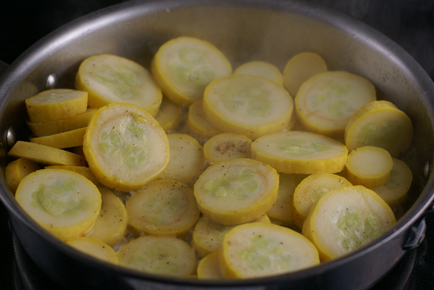 Cover the squash for about 2-3 minutes, allowing the steam to begin cooking the squash. Uncover the squash and stir with wooden spoon. Let the remaining water boil off and then saute the partially cooked squash for 3-4 minutes…or until begins to brown. 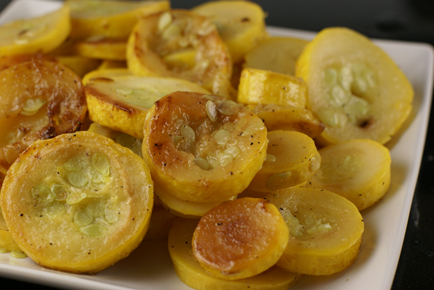 Once a few of the squash slices begin to brown, saute another 2 minutes, stirring constantly. Oh my – what a great tip! I too have had the same problem and I will try this next time. Thanks for sharing this great recipe, is it definitely a money saver with a lot of savory flavor! I like the fact that there are so few ingredients. I am a big fan of recipes with four ingredients or less. It is amazing what you can do with four ingredients! I make this alot and add a little parmesan on the top. Good tip too! It sounds like a good recipe, but I think a step in the directions was left. After first direction step, “Place the sliced squash . . . ” you don’t say how high to heat the burner. I am just going to guess this one…just thought you ought to know.